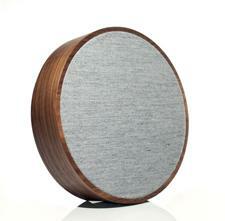 Tivoli Audio has introduced the new ART collection of wireless speakers. The first two models in the series are the CUBE (shown, right) and the ORB (shown, below). Both speakers support Wi-Fi and Bluetooth, as well as smartphone control and the ability to link multiple ART speakers together for multi-room playback. They feature furniture-grade wood cabinets in a variety of finishes, plus acoutiscally transparent fabric grills. Tivoli also offers the ConX transmitter/receiver system to wirelessly send audio from legacy sources. Tivoli Audio officially announced the worldwide availability of the new product line, ART by Tivoli Audio, on tivoliaudio.com and through their dealer network. 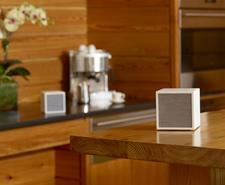 The first offerings of the collection consist of two Wi-Fi and Bluetooth enabled speakers, named the CUBE and ORB. These speakers effortlessly offer a unique mix of style and sound, enhancing your home décor with cable-free high-quality music streaming. With their easy-to-use controls and full feature app, the CUBE and ORB allow you to stream music from your favorite services, such as Spotify, Deezer, and TIDAL via any iOS or Android device. The ART speakers can perform in mono, stereo, or be used as a multi-room system, and with their optional rechargeable battery, moving speakers throughout the home has never been easier. Cased in a furniture-grade wood cabinet, the CUBE and ORB are offered in walnut, black, and white, and are finished with a high-quality fabric speaker grill, which developed from a collaborative partnership between Danish fabric brand Gabriel and Tivoli Audio. The fabric offers acoustically transparent qualities and is EU-Ecolabel environmentally friendly. The two companies are working together to inject seasonal colors and new materials to this collection. The ART by Tivoli Audio collection was designed and created by the company's Vice President of Product Design, Paul De Pasquale. Although conceived by De Pasquale, the choice to call the collection ART, which stands for Audio Reimagined Together, is a reflection of the company's creative and collaborative culture. Said De Pasquale "Tivoli Audio has always been known for its attention to beautiful designs, details, and audiophile-worthy products at affordable prices. We wanted to take this philosophy one step further and really blur the lines between home audio and design, creating Audio ART, which complements one's home décor and lifestyle through music." In addition to the CUBE and ORB wireless speakers, Tivoli Audio has added the ConX, a Wi-Fi transmitting and receiving dongle, to the ART collection. The ConX enables you to broadcast audio from any receiver, turntable or even tape deck to the ART speakers. The ConX can also make your existing speakers Wi-Fi enabled, allowing you to stream music sources wirelessly to them. The CUBE, ORB, and ConX are just the beginning of the collection, as Tivoli Audio plans to release additional products by summer of 2017. • Visit the Tivoli Audio website for more product information. • Check out our Bookshelf Speaker news archive for similar product announcements.